Tien Tsin peppers are also known as Chinese Red Peppers or Tianjin peppers. They are originally harvested in China and popular in Asian cuisine such as Hunan or Szechwan styles. One tiny Thai red chili is many times spicier than a jalapeño. The capsicum in hot peppers is not only responsible for the spiciness but also provide many health benefits such as boosting metabolism and accelerating fat burning. The Trinidad moruga scorpion is native in Trinidad and Tobago. It was recently crowned as the new world's hottest chili pepper with more than 2 million Scoville heat units (SHU). It may be small, but its heat, hint of fruitiness and smoky flavor goes a long way. Pequin pepper is commonly used as a spice. The popular Cholula brand hot sauce lists pequin peppers as its ingredient. In 2007, Guinness World Records certified that the ghost pepper was the world's hottest chili pepper, 400 times hotter than Tabasco sauce. It is popularly used in combination with pork. Also called pork rind. They are high in sodium and fat but low in carbohydrates. They are considered as an alternative snack in Atkins diet. Ground pork is finely chopped and mixed with baby clams. Main seasonings are soy sauce, chili oil and ginger. 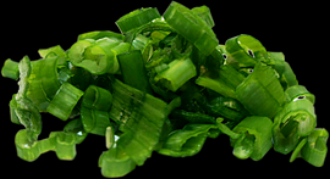 Scallions are leafy herbs in the allium family which also includes onion and shallots. They contain many remarkable flavonoid, anti-oxidants, plant fiber, minerals, and vitamins all are beneficial to bodies. Ramen with Chinese flavors + byob. Excellent.